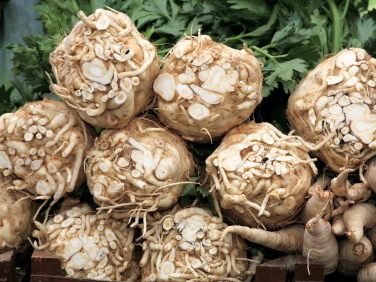 The pickup: Huge and bulbous, with a knobby, wrinkled skin, celeriac (also known as celery root) is one ugly duckling. But celery root is a versatile vegetable with a delicate flavor somewhere between celery, parsley, and artichokes. Its flesh is reminiscent of potatoes; unlike spuds, however, celery root can be eaten both raw and cooked, making it equally suitable for crunchy salads and creamy soups. So I hit my local grocery, where the hard, firm, and definitely hideous root earned me weird stares at checkout. At home, I assembled the rest of the salad’s ingredients — fennel bulb, parsley, and a lemony vinaigrette — before turning my attention to the two-pound root resting on my cutting board. Twenty minutes and a cut to my thumb later, I’d finally wrestled the inner root out of its tough skin. Then I simply shaved the snowy white bulb into paper-thin strips with a vegetable peeler and tossed everything together. Lessons learned? Use a good, sharp knife and a sturdy peeler to speed up the prep time, and for more flavor, sprinkle the salad with freshly grated Parmesan. Celeriac also makes a good mix-in for smashed potatoes and a delicious base for soup.